HE Zheng, LI Guang, ZHANG Hongwei, ZHANG Shuo. Predictive Value of Proton Magnetic Resonance Spectroscopy in the Evaluation of Radiotherapy for Patients with Brain Metastases from Non-small Cell Lung Cancer[J]. Journal of China Medical University, 2017, 46(12): 1095-1100. Abstract: Objective To investigate the predictive value of proton magnetic resonance (MR) spectroscopy (1H-MRS) in evaluating the therapeutic efficacy of radiotherapy for patients with brain metastases from non-small cell lung cancer (NSCLC).Methods Fifty-six patients with brain metastases from NSCLC underwent 1H-MRS examination before treatment with stereotactic radiotherapy (SRT) in addition to whole brain radiotherapy (WBRT). The patients were divided into two groups according to their pretreatment choline-to-creatinine (Cho/Cr) ratio. The therapeutic efficacy of radiotherapy was compared between the two groups, and the prognostic value of 1H-MRS examination was analyzed.Results The median pretreatment Cho/Cr was 1.989. The overall survival rates at 1, 3, and 5 years were 29.3%, 0%, and 0% in patients with higher pretreatment Cho/Cr, and 70.5%, 22.3%, and 1.8% in those with lower pretreatment Cho/Cr. The mean survival time was significantly lower in patients with higher pretreatment Cho/Cr than in those with lower pretreatment Cho/Cr (9.77 vs. 24.67 months, P < 0.05).Conclusion Pretreatment Cho/Cr has a predictive value in the evaluation of radiotherapy for the treatment of NSCLC brain metastasis. 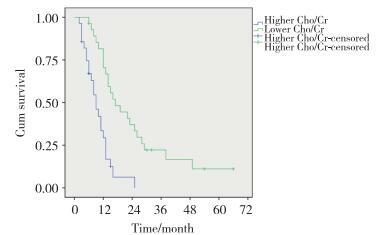 Patients with higher pretreatment Cho/Cr have worse prognosis overall.